Hi, Tim! When is your employer going to make you head of your own WW1 aviation department? On a more reverential note, have you ever held one of those WW1 Turkish propeller fezes? As for those fezes (fezzes, fezae??? ), I have never seen one up close in the real world, not even just the badge itself. 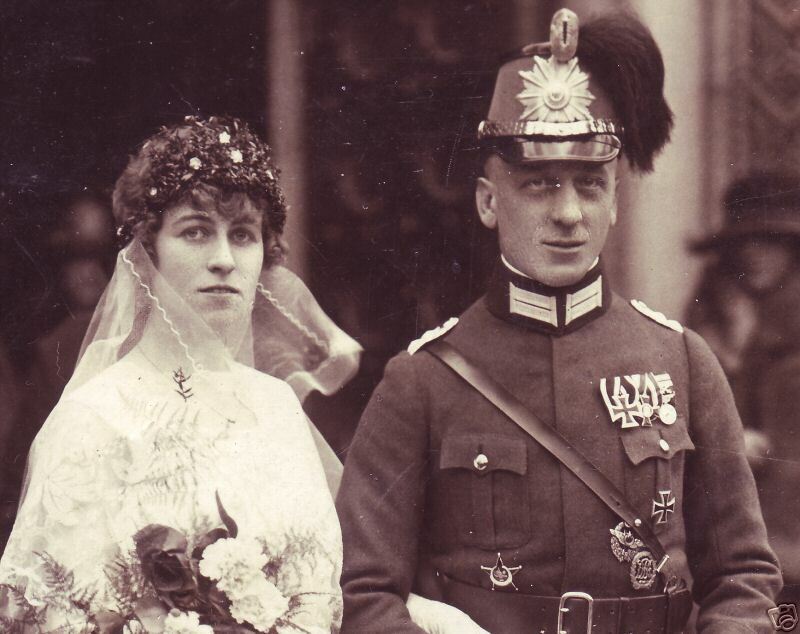 That has to be one of the great rarities in WW1 headgear. I can't remember ever seeing one on the market. That furry fez-like thing Turkish pilots and some Germans (Buddecke for example) wore, is called a "KALPAK." The NASM/Smithsonian at one time, had one in it's collection, although whether it's still there or not I can't say for certain. Karl Scheide, the former curator at NASM during the early/mid 1990's was caught stealing and selling items to a militaria dealer who in turn sold them on the collector market. Scheide was convicted, co-operated on helping to get many of the items returned, and the dealer when pressured by the FBI also co-operated. From what I've heard from one well-informed source (and I'm not providing more details or names) is that many items were recoevered, but not all. The FBI and Smithsonian both wanted to close the matter as quickly as possible without too much information going public. One of the items Schneide offered the dealer was a Kolpak, that a close friend of the dealer (and someone that I also know reasonably well) looked at, and was concerned about where it came from. His concerns were justified within a short time of seeing and handling the Kolpak. I was told the Kolpak was sold (in a hear beat), but not who bought it, or that it was ever returned. Anyone ever seeing or being offered a Kolpak for sale is advised to check the items history, and chain of ownership. John, do you know where the "Brampton" got it's Kolpak and how long it was there before being sold? The Brampton Museum shut down about the same time, in the early to mid 90s as the flying guys on the field cut back the funds, I was told, for the museum on its premisis. The mannekins were on public view since the 70s, I believe, since I never made the trip, but could not tell you how long individual exhibits were acquired or on view. I just googled the Museum and it appears to have been reconstituted. You might email the curator with your query and keep us posted! Shame on me for forgetting that. Bizarre part is I actually like the quality of this one. First one in forever. despite the fuzzy scans, it actually looks legit. My question would be legit from when? 1920's? 1930's?, 1970's? Here's another one, Stogie. I just didn't shine this on my sleeve like you did. I see these fairly often at bigger shows, this one with a Meybauer mark. You like this one, too? His face has been seen before. The really interesting part here is we have a J?ger with 3 Turkish Decorations, a Turkish Pilot Badge but NO corresponding German and/or Austrian Pilot Badge! I noticed that, but I gather it's not that uncommon. Here's Buddecke with only his Turkish Pilot's badge. But then the Jaeger is wearing full dress. He should have everything on he's entitled to, shouldn't he? Maybe he didn't want to pay for a retired pilot's badge. Was it permitted to wear a regular pilot's badge after the war? Hi John, yes, I believe it was. The "retired" pilot badge was a war-time piece to distinguish between flying/non-flying. An interesting aside........ You will see lots of WW2 photographs with Luftwaffe personnel wearing a retired PB, an Observer B, but I can't think of one I have seen with an actual WW1 PB on!?!?!? J?ger? Isn't that a Polizei outfit? Hi Chip, didn't the J?gers where that Kepi as well? My error is entirely possible, Uniforms are not my area of experience at all. The Sam Browne belt is the first tip-off. The "sunburst" star Wappen is typical of the postwar police. If you compare it to a Garde star you will find that even the basic outline is different and other than the general impression, they don't have much in common. 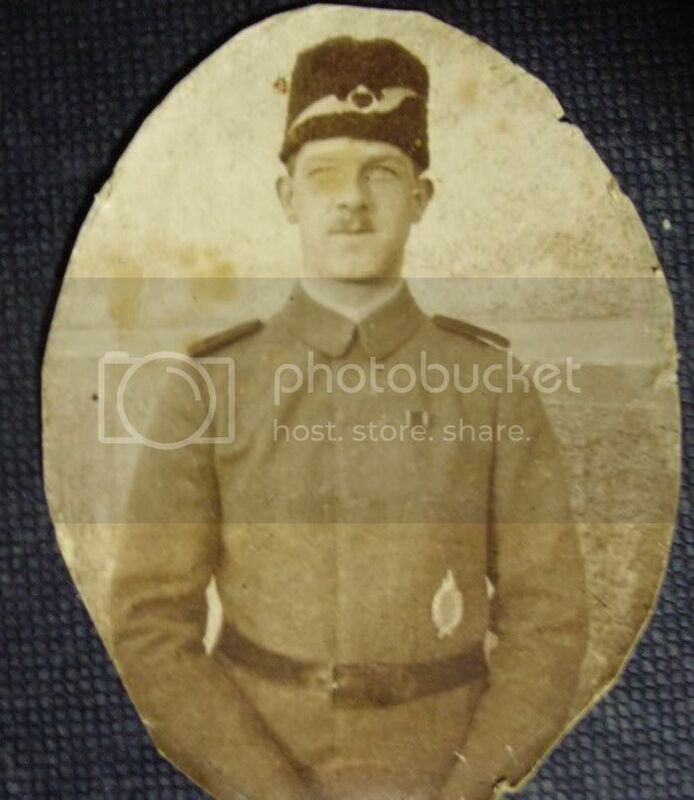 Other clues are the plain pocket buttons, the Graugr?n wool material on the body of the shako (J?ger officer's would have had black wool), the black visor and trim (Garde MGA officer's would have light brown leather), the Weimar era badge just below the Turk pilot's badge, etc. My uneducated guess based on the collar Litzen (as opposed to the early police Kragenpatten with button) is that this photo dates from the late 20's or very early 30's. My uneducated guess based on the collar Litzen (as opposed to the early police Kragenpatten with button) is that this photo dates from the late 20's or very early 30's. Well, Rick and I got the date right in our discussion of Prussian Pilots vs Comm. Pilot's badges in wear after the war. But thanks for the other details, Chip! Is he marrying a Turkish girl so is heavying up on Turkish decorations for the in-laws? Isn't this actually a police officer? Hi Andreas, if you look at the 3 prior posts that was already discussed. 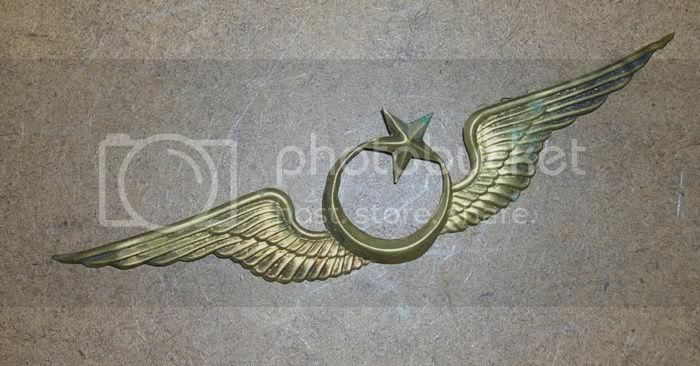 I know this is not a pilots badge and I hope you will excuse me for posting this. Since you were talking about the Kalpak, I would like to show you this and get an opinion. This insignia was purchased by me some time ago and may not be real, but I have seen no others for sale. It is made of very thin brass with wires on the back for attachment. Tim, and everyone else, I would like to hear your comments on this. I'm thinking some type of cap badge. Dimensions are... ? 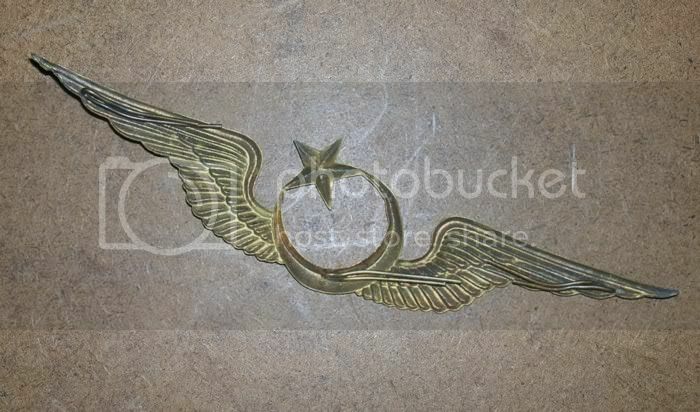 Sorry, this supposed to be the winged crescent and star worn on the Kalpak. Length is about 6 inches. Here is a photo from a locket of a grouping I own showing one in wear. Note: I am not saying this is the same badge, the items came from two different sources at different times. I cannot imagine these are being reproduced... talk about an obscure area! Whatever it is, and I agree it looks like the insignia on the Kolpak (though a little rough looking for an officer's badge) it looks like it evolved into this badge now on eBay, whatever it is, which looks like a distant cousin of a RNAS eagle. Tim??? OK, now that's one cheesy looking badge! Prize in Turkish Cracker Jack, I mean Kracker Kemal? Well, not having ever seen a real one for sale, I guess it looks as good as any other. There could be fakes, but since I have never seen any on the market, I doubt that anyone has started faking them . . . yet. There are some design differences from the one in the posted photo, but that's to be expected. I think it's legit.